This is Buddy. I'm not sure of his breed, maybe terrier. He was a stray that showed up and decided he liked it so he stayed. He loves to ride on a float in the pool, ride on the 4 wheeler, tease the cow. This is the sweetest little doggy, I can't believe someone just dumped him out in the country. Sure is a cute pic of Buddy. He's quite a water boy and he looks like he has Jack Russell in him too. 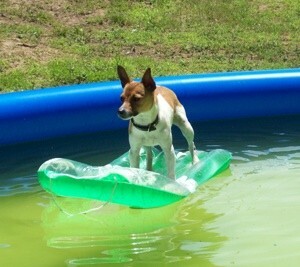 My brother-in-law has a Jack Russell and this breed is highly intelligent. I am so glad someone did leave him in the country for you to find. He's lucky and so are you. He does look like a Jack Russell terrier. Cute little guy. I had a Toy Fox Terrier and he looks just like her. They are very intelligent and love their owners. I believe your terrier is a fox, looks just like our jack we have. If so you have a great pet here, I know ours is. I've never seen a dog like him, he's right by our side, a great pet. Sometimes I think animals sense where to go for help. Buddy certainly found the right people! Buddy looks just like my dog "Chico" he's a Rat Terrier. They share the same color and in the exact same places of their body. I love my "Chico". We've had him for 4 years now. He's the most wonderful dog. Enjoy your Buddy. They are energetic dogs and very lovable as well. Buddy knew a good home when he saw it. He's lucky to have you as you are lucky to have him. I can't wait until I can get a dog. Right now I'm not home enough and it wouldn't be fair. But once I retire I'm going to get a dog. I have a cat and he is my pride and joy and I love him dearly. Wow is he leading the good life. Looks like he is a lot of fun and love.